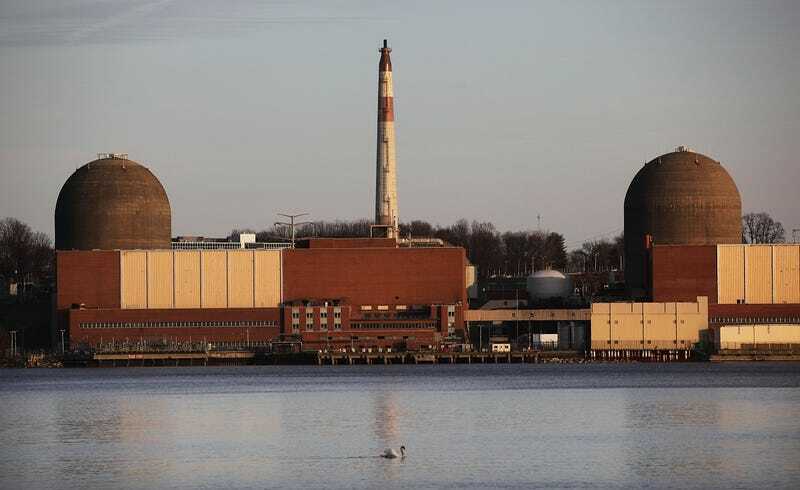 Buchanan New York’s Indian Point Energy Center, a three-unit reactor power plant, reported yesterday afternoon that radioactive tritium has been detected in groundwater testing wells near the facility. Three groundwater monitoring wells surrounding the plant have reported radioactive samples. Despite the discovery at the site, the risk to the public in this instance is low: the discovery is far removed from drinking water systems. That said, tritiated water is often diluted and routinely released from nuclear power plants. Instead of a single proton and neutron, Tritium has a proton and two neutrons. As it decays, beta particles travel only about 6 millimeters, and can’t penetrate human skin. However, if it is inhaled or more often, ingested, it can present a radiation hazard. This can be worrisome, because tritium can bond with oxygen to form water molecules: because of its chemical structure, it can’t be filtered out, hence the dilution. Our first concern is for the health and safety of the residents close to the facility and ensuring the groundwater leak ‎does not pose a threat. After the revelations that the water systems of Flint, Michigan and other major cities across the United States have serious issues with lead and other heavy metals, there’s a real concern when it comes to public infrastructure. Several of Entergy’s nuclear plants have experienced similar leaks of radioactive tritium: The Vermont Department of Health has noted ongoing investigations into leaks at Vermont Yankee since 2010, while New York’s FitzPatrick Plant has been “plagued by water leaks” in 2014. The Indian Point facility is owned by the Entergy Corporation, which operates ten nuclear power plants across the United States. Several of its plants in the Northeast, including Vermont’s Vermont Yankee Nuclear Power Plant, Massachusetts’ Pilgrim Nuclear Generating Station and New York’s James A. FitzPatrick Nuclear Power Plant have closed or are slated for closure, due in part to increased competition with cheaper oil and natural gas energy supplies. As nuclear power has become less competitive with other energy sources, they are becoming less profitable as they become more expensive to maintain. While Entergy has been motivated to close down its power plants due to increased competition from other energy sources, many of the plants under its control are have reached the ends of their forty-year licenses: Indian Point’s Units 1, 2 and 3 were activated in 1962, 1974 and 1976, respectively, while the Fitzpatrick plant was brought online in 1975. Pilgrim and Vermont Yankee were brought online in 1972. These plants are facing more expensive upkeep in the years ahead, and that pressure has pushed the company to begin shutting down their nuclear plants. While Indian Point has had a decent service record over its history, Governor Cuomo has called for the plant to close as of late last year. In the meantime, an investigation has been launched into the leaks. While increases in radiation have been detected in three (of the forty) groundwater testing wells, these levels still remain below federal safety limits.